Burlington Police Chief Michael Schirling, with Burlington Mayor Miro Weinberger in the background, announces his retirement. Burlington Police Chief Michael Schirling, who started with the department as a 19-year-old auxiliary officer, announced Tuesday that he will retire in June after spending his entire career in the Queen City. 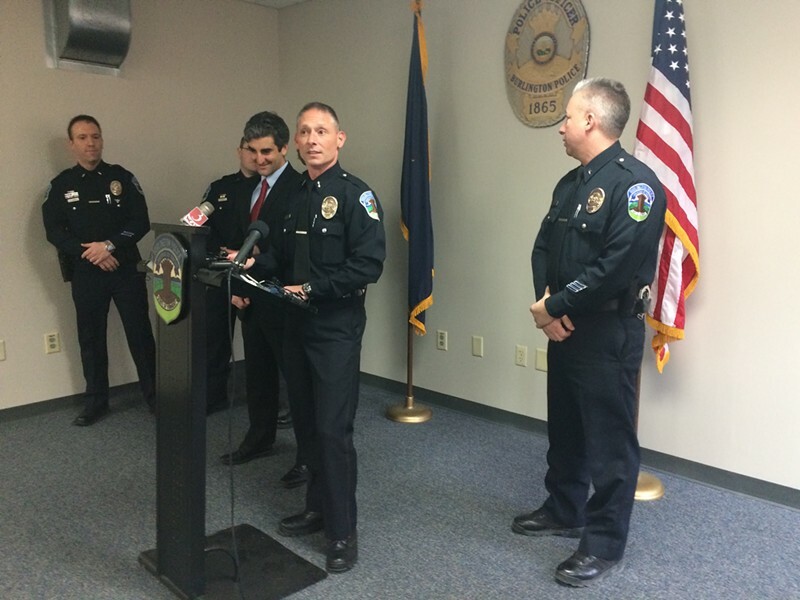 During a news conference attended by more than a dozen officers and a smattering of city councilors, Schirling, 45, said he is leaving after seven years as chief. "It's not the years that get you, it's the miles," Schirling, 45, said. "I want to be able to have a long life, and there's no question that this work takes a toll." Mayor Miro Weinberger called Schirling one of the "great chiefs" in the department's 150-year history. "He is a consummate professional, always prepared ... and he never backs down from any challenge or demand placed on him or his job," Weinberger said. The mayor credited Schirling with implementing community policing initiatives to improve the department's ties with Burlington residents, and creating outreach teams to work with the mentally ill and other special needs groups. A technology geek, Schirling also created and implemented a dispatch and records-management software program for the department. Weinberger said he will convene a search committee representing the "diversity of our city" to find Schirling's successor. Schirling said he would "absolutely" prefer that someone from within the department replace him. Schirling began working for the department in 1989 while studying at the University of Vermont. He was a biology major who initially planned to be a doctor. Later, he switched his major to political science. Schirling said he figured he would work as a cop for starters. "I decided I'd do this for a couple years before I figured it out," Schirling said. "I'm still figuring it out." He rose quickly through the ranks. In February 2008, he was promoted to chief to replace Tom Tremblay, who departed to run the Vermont Department of Public Safety. A Burlington native, Schirling is married with two children. His parents still live a stone's throw from the police department. Schirling said little about his plans. "I really don't know what's next," Schirling said. "It's time to freshen up and do something else."